The bad air in Denver is notorious. It’s so bad that it has a name – the Brown Cloud. Denver’s location at the foot of the Rocky Mountains make it prone to temperature inversions in which warm air traps cooler air near the ground, preventing pollutants from rising into the atmosphere. Warm air is lighter than cold air. Hot air balloons rise because the warm air inside the balloon is lighter than the cold air surrounding it. In the wintertime, the sun warms the surface of the earth during daylight hours. This warm air rises and mixes with other atmospheric gases. When the sun goes down, the surface area cools and the air gets colder. The less dense warm air high up in the atmosphere often blankets the colder air that rests closer to the surface of the earth. Because the colder air is more dense than the warm air, the colder air is trapped close to the earth and the atmospheric gases do not mix. This is a temperature inversion. Why is a temperature inversion bad for air quality? Air pollution is more noticeable during a temperature inversion since pollutants such as car exhaust are trapped in the layer of cold air close to the earth. As a result, state agencies in many parts of the country oxygenate automobile fuels during winter months with additives like MTBE in an attempt to reduce the harmful effects of trapped pollution. This trapped pollution is what causes the “brown cloud” effect. Wind or precipitation can help alleviate the brown cloud effect by stirring up and breaking up the warm layer of air that traps the cold air and pollution down near the surface of the earth. Warm water, like warm air, is less dense than its cold counterpart. 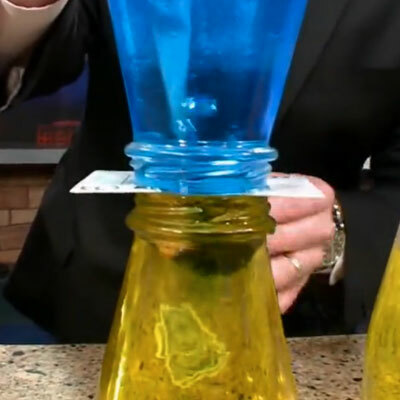 You can demonstrate the effects of a temperature inversion by using bottles of warm and cold water. 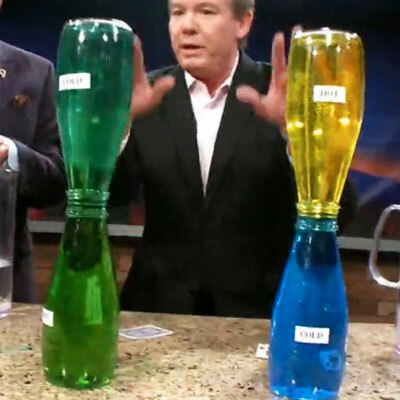 Fill an empty juice bottle with warm colored water and carefully place it over a similar bottle of colored cold water. Do the liquids mix? Now, place the cold water bottle over the warm water bottle. When the bottle of warm water is placed on top of the cold water, the more dense cold water stays in the bottom bottle and the less dense warm water is confined to the top bottle. However, when the cold water bottle rests on top of the warm water, the less dense warm water rises to the top bottle and the cold water sinks. 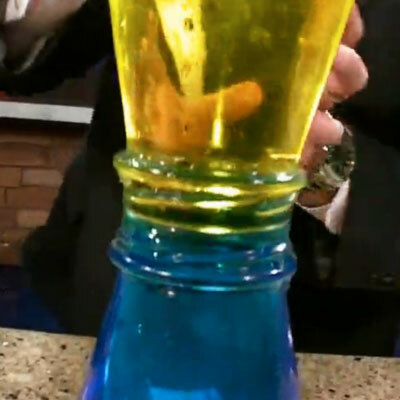 The movement of the water is clearly seen as the yellow and blue food coloring mix, creating a green liquid. The movement of warm and cold water inside the bottles is referred to as the convection current. In our daily life, warm currents can occur in oceans, like the warm Gulf Stream moving up north along the American Eastern Seaboard. Convection currents in the atmosphere are responsible for the formation of thunderstorms as the warm and cold air masses collide. For complete step by step instructions and more on temperature inversions, visit the Brown Cloud Temperature Inversion Experiment Page. Wow it’s simple yet amazing chemical/physical process but quite amazing yet.